In today’s world, metal fabrication and welding shops have a lot to offer, and unless you have a very clear vision, this plethora of possibilities can make the decision-making process all the more difficult. Not only do you have to work out design configurations, but you also have to choose the most appropriate material. In today’s blog, Fort Miller FAB3 would like to offer you some assistance in this pursuit. Specifically, we are going to discuss the benefits and differences of two common fabrication materials—stainless steel and aluminum. If you are in the New York area and in need of fabrication services, do not hesitate to call us for a free consultation. From CNC machining to laser cutting to robotic welding and more, we take great pride in our capabilities and the quality of our work. 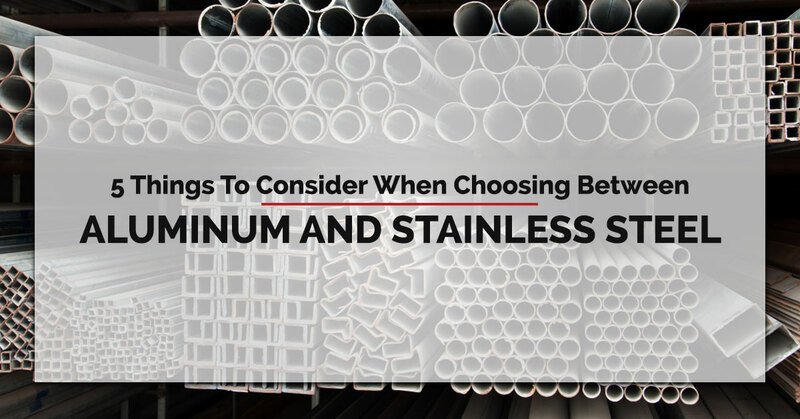 Below are four things to consider when choosing between aluminum and stainless steel. If whatever you are making will be used in high-heat environments, it’s important to pick a material that matches these needs. In terms of conducting heat, aluminum is superior to stainless steel. This is why aluminum is often found in cars and air-conditioning systems. Though stainless steel is not great with transmitting heat, it does have a much higher melting point than aluminum—aluminum softens at 400 degrees Fahrenheit, whereas stainless steel can withstand temperatures up to 2000 degrees Fahrenheit. Both steel and aluminum are highly resistant to corrosive elements. With that being said, stainless steel is considered by most to have the edge over aluminum. Stainless steel is made up of iron, manganese, nickel, copper, and chromium. The addition of chromium gives it a strong anti-corrosion property. Similarly, aluminum has a composition that is strongly resistant to oxidation. However, in extreme conditions, like a highly acidic environment, aluminum is known to corrode. As you likely already know, stainless steel is known for its strength and durability. It is considerably stronger than aluminum, and it is less likely to bend, warp, or melt. This has naturally created a precedent, whereby stainless steel is preferred in situations where these properties are desired—think energy sector and construction. Conversely, aluminum, which is not as strong but weighs significantly less, is used in the fabrication of parts for aircraft and marine vessels. The process of fabricating aluminum and stainless steel vary a great deal. For example, though aluminum is very workable, making it great for cutting and molding into various shapes, it can be fairly hard to weld. Whereas stainless steel, on the other hand, can easily be welded to create lasting joints and bonds. Because aluminum has a much lower melting point, overall it is much more malleable during the fabrication process. As you have likely gathered, each metal has its benefits and limitations. Which metal you choose is ultimately determined by your intended application. If you are not sure which material is most suited for your needs, we can help you figure it out. If you have questions for our expert fabricators, do not hesitate to contact us. We take great pride in our work, and we expect perfection at every stage of the process. Whether you need turn-key metalworking, CNC machining, bending, laser cutting, robotic welding, or some other fabrication service, we are ready to meet your exact needs and to establish a fruitful, long-lasting business partnership. We serve New York, New Jersey, Massachusetts, Pennsylvania, Rhode Island, New Hampshire, Vermont, Maine, Delaware, and Connecticut, and we are more than happy to take on custom projects and match our capabilities to your needs. Schedule your consultation today!